Going through divorce is one of the most difficult times in a person’s life. We at the Laredo Firefighters Retirement System understand that and we are here to help guide you through the process as it affects your retirement benefits. In doing so, we hope to make the process as smooth as reasonably possible. However, please understand that we cannot give legal advice to individual members and this document shall not be interpreted as rendering legal advice or establishing any attorney-client relationship. Pension benefits which accrued while you are not married are considered your separate property and the court will typically award all of those benefits to you. The pension benefits you accrued during the marriage are, under most circumstances, considered community property and, unless otherwise agreed (discussed below), are divided equally by the court in a divorce proceeding. Please understand that the court divides property according to the community property laws of the State of Texas. The Laredo Firefighters Retirement Fund does not make any determinations about property. Agreement between the spouses carries a great deal of weight with the court. Even under the best of circumstances, when the divorce is amicable and there are no significant disputes between you and your spouse (such as a disagreement over child custody), the divorce process is slow. Texas law provides that, with few exceptions, a final divorce may not be granted until expiration of a period of 60 days from the time a formal petition is filed at the courthouse. During this “cooling off” period, there is usually plenty of time for you and your spouse to try to agree about how to divide your community property. You and your spouse may of course wish to be represented by counsel during this process. Since important legal rights are involved, Laredo Firefighters Retirement Fund encourages you consult with your attorney. Some couples agree that the member’s pension benefits are not to be divided (for example, if both parties have retirement plans of comparable value or if the Laredo Firefighters Retirement Fund member “gives up” some other asset of similar value in order to be able to keep the entire amount of his or her Laredo Firefighters Retirement Fund benefits). Especially in circumstances where there were only a few years of service during the marriage and it is expected that the member is many years away from retirement, both parties may benefit from a settlement such as this. 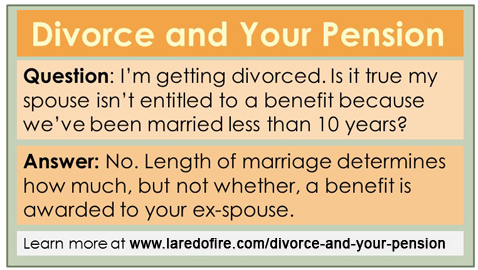 If in its decree the court divides your pension benefits and the parties want Laredo Firefighters Retirement Fund to make direct payments to the spouse (alternate payee), the court also signs a separate order either at the time of divorce or later, depending on the preferences of the parties getting divorced. This order is referred to as a “Domestic Relations Order.” Since the division of benefits must be one that Laredo Firefighters Retirement Fund can effectively administer and also must be compatible with the Laredo Firefighters Retirement Fund plan, it is important that the Domestic Relations Order be acceptable to Laredo Firefighters Retirement Fund in how it is written for various legal concerns. If it is not acceptable, Laredo Firefighters Retirement Fund will reject it. This is unfortunate in that it will cost you and your spouse time and money because rejection will require that the Domestic Relations Order be corrected and resubmitted to the court for signature. Because many courts and attorneys are not familiar with the Laredo Firefighters Retirement Fund plan, it has been difficult for them to prepare Domestic Relations Orders that meet Laredo Firefighters Retirement Fund requirements. To help our members avoid rejection of DROs, the Laredo Firefighters Retirement Fund has developed a Domestic Relations Order form for your use. Domestic Relations Orders that meet the requirements of state law and Laredo Firefighters Retirement Fund requirements are considered “qualified” and the Domestic Relations Order is considered a Qualified Domestic Relations Order or “QDRO” for short (usually pronounced “qua-drow”). 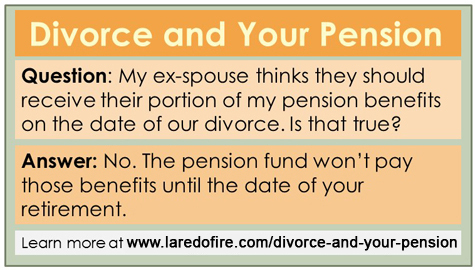 We strongly encourage you to involve Laredo Firefighters Retirement Fund staff early-on in the process, to help make sure the Domestic Relations Order is in proper form and that the calculations relied upon for the Domestic Relations Order (and the divorce decree) are accurate. If you file a petition for divorce or you discover your spouse has done so, please contact us as soon as possible in order that we might assist you. Hopefully Laredo Firefighters Retirement Fund has already seen a draft Domestic Relations Order before the judge signs it, as described above. However, once the judge has signed the Domestic Relations Order, one of the parties or their attorneys should send a certified copy of the Domestic Relations Order to Laredo Firefighters Retirement Fund, along with a regular, (not certified) copy of the divorce decree (if it has not previously been provided). A certified copy of the Domestic Relations Order must be obtained directly from the clerk of the court that granted the divorce. Be sure to send a certified copy bearing the original certification of the clerk indicating that the clerk has reviewed the original order and certified that the copy is a true and correct copy. Please do not just send a copy of the certified copy. When Laredo Firefighters Retirement Fund staff receives the certified copy of the Domestic Relations Order, the certified is then forwarded to the system’s attorney. The attorney will review the order to determine whether it meets all criteria established by law and the Laredo Firefighters Retirement Fund plan and whether it should be considered “qualified”, as discussed above. The law requires this review, even if you use our Qualified Domestic Relations Order form (just because the form is titled “Qualified Domestic Relations Order” does not mean it is automatically considered “qualified” – it still must pass scrutiny). The system’s attorney will notify both parties and their attorneys in writing of the determination. Again, this is why Laredo Firefighters Retirement Fund should be involved early-on in the divorce process. A couple of other items of note: (1) If a QDRO is in effect, it remains in effect until the court dissolves it - even if you and your former spouse remarry. 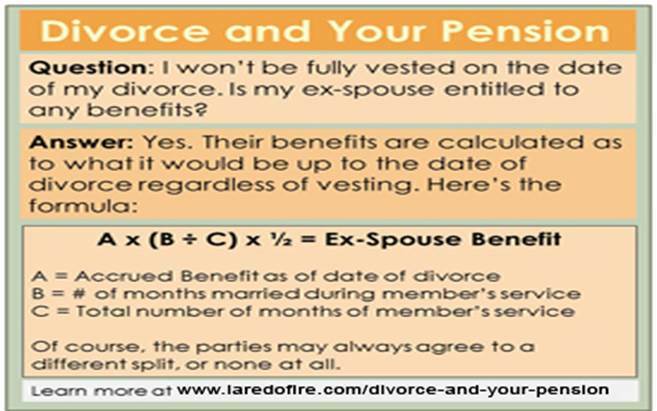 If you and your spouse remarry, don’t forget to dissolve the QDRO (unless you don’t want to for some reason – but you should seek legal advice); (2) If you are involved in more than one divorce, Laredo Firefighters Retirement Fund can administer more than one QDRO provided the subsequent Domestic Relations Order does not attempt to require Laredo Firefighters Retirement Fund to pay benefits to the second alternate payee that are required to be paid to the first alternate payee. You should follow the process described above for each Domestic Relations Order. If you or your attorney has any questions or need calculations or the form QDRO, call or e-mail Jaime jasso ( jaime.jasso@laredofire.com ), with the understanding that we will help as much as possible but cannot give legal advice to either you or your spouse.